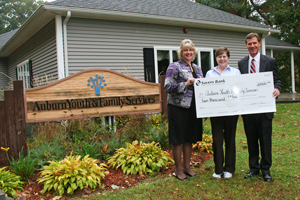 Southbridge, MA (October 24, 2012) — Savers Bank announces a $2,000 donation to AYFS-Auburn Youth and Family Services of Auburn. This donation will be used to help fund family and individual counseling, after-school programs, a food pantry and much more. Auburn Youth & Family Services, Inc. is a private, non-profit, multi-service organization for children, young adults, and families of Auburn. Formerly known as the Auburn Project, the original focus was prevention of drug/alcohol abuse through education and intervention. Over the years, the program has expanded. In 1991, the agency’s name was changed to Auburn Youth and Family Services to reflect their growth and expansion of services. The services of AYFS encompass the treatment of the entire family, focusing on intervention and early prevention. “In the past few years, many families have felt the effects of the uneasy economy. AYFS’s services have become even more crucial during this time, by helping families get on the right path, while encouraging self-sufficiency,” commented Joseph Coderre, President and CEO of Savers Bank. Each year, Savers Bank helps address a wide range of needs in the communities placing a special emphasis on relationships with local organizations, which help our communities grow strong. With offices in Southbridge, Uxbridge, Auburn, Grafton, Charlton, and Sturbridge, Savers Bank is a member of the Federal Deposit Insurance Corporation (FDIC), the Federal Home Loan Bank, the Co-operative Central Bank, and Massachusetts Bankers Association. Founded in 1910, Savers Bank has assets of over $400 million, offers a full range of consumer and commercial banking services, and a strong legacy of community commitment and customer service. For more information call 1-800-649-3036 or visit the website at www.saversbank.com. The mission of the Blackstone Valley Chamber of Commerce is to promote the economic vitality of the Blackstone Valley and meet the needs of the Chamber’s business members, while providing leadership on issues which impact the economy and quality of life in the Valley. The Blackstone Valley Chamber of Commerce serves the eleven towns in the Massachusetts BV Region: Blackstone, Douglas, Grafton, Hopedale, Mendon, Millbury, Millville, Northbridge, Sutton, Upton and Uxbridge. For more information on the Chamber please contact administrator@blackstonevalley.org or call 508 234 9090 X101.